Up and at ‘em! After a quick breakfast we left our cocoon at the Taj and headed to the airport. Travis was waiting, and we set off immediately for Kathmandu. Kathmandu??!! (I still can’t believe it). The sound of it till evokes Cat Stevens and our youthful dreams of faraway, exotic and spiritual places....a city with 7 UNESCO World Heritage Sites! The flight was beautiful (as you can imagine)...and the landing was perfect. Julian was required to take special training in order to land at the airport in Kathmandu, and he did it perfectly. The ride from the airport to the hotel was quite long because of traffic, and was one of the most adventurous drives of our trip so far! The roads were like nothing we’d ever seen (even the back roads of Kenya didn’t compare). There were crevices, bumps, rocks and surprises at every turn, and the driving was mayhem, even when we were sitting still. Still, it was somehow all aglow with the aura of Kathmandu...city of devout Buddhists and seekers and trekkers and aging hippies. Suddenly in the midst of relentless bumps and swerves, we made a turn into the driveway of an unexpected refuge...the Hyatt Regency! Good grief! What stunning grounds and ambiance. Open to the weather, the lobby centers around space and art and demands peace the moment you step in. We were happy to have arrived. Soon after our arrival, we heard back from a couple we’d been in touch with thanks to Shradha! Nabin (of Kathmandu) and Yvonne (originally from Germany) and their two gorgeous (oh yes...gorgeous) and insanely smart kids! Nabin and Yvonne had also served as volunteers in Haifa, and had now made their home here in Nepal. 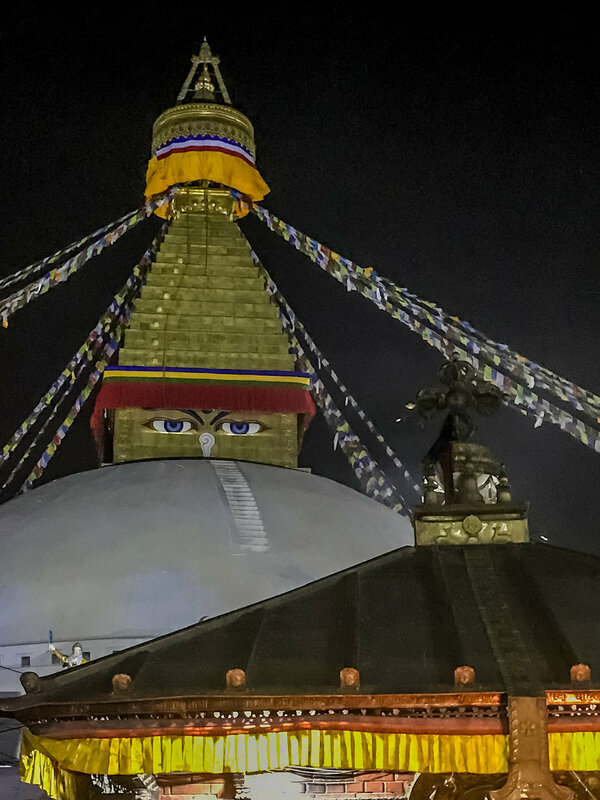 We met Yvonne and the kids in the hotel lobby, and walked through busy, half dark streets to the closest Buddhist shrine, the Boudhanath Stupa, where several ceremonies were taking place. Within its courtyard and across the street, giant prayer wheels were being turned, and along the walls surrounding the stupa, many prayer wheels invited passers-by to turn them. We headed to a restaurant to meet Nabin, but it was being painted so after some consultation we all headed to the party the kids had just left, and they were so very happy! Nabin is deeply involved with the sports association in Kathmandu, and this party was to celebrate the end of the season. 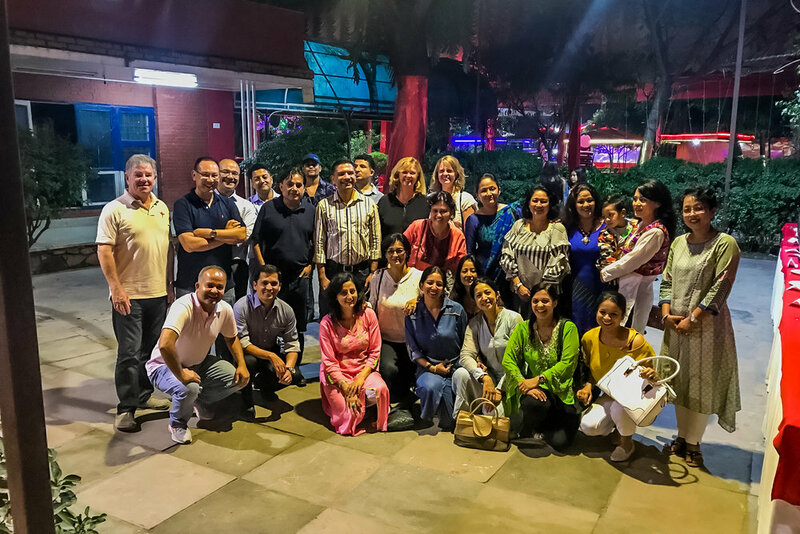 It was held in a party venue, and we walked into a warm welcome, a table laden with typical Nepalese food, music and dancing! What a treat! We danced! We ate! We talked! Fun was had by all. 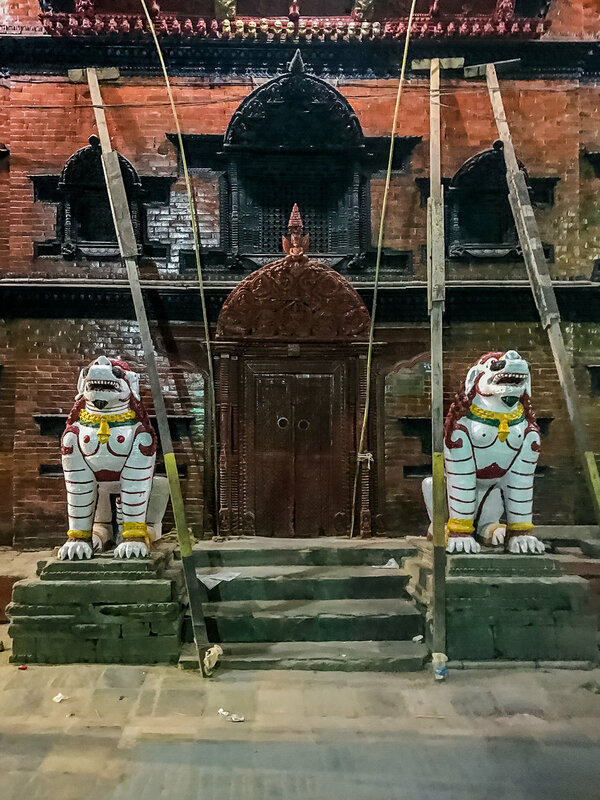 As the party dispersed, we got back in the car to explore the older area of the city, Durbar Square, tragically tested by an earthquake in 2015. While the area has obviously recovered substantially, there is obvious repair still underway, and scaffolding holds up many of the endless shrines and temples. It was late, but there were still many paying homage to these shrines, with incense, flowers and prayer. The streets were dark, but we never felt worried...about anything at all. We would’ve been happy to be in the company of this special family anywhere at any time. Dwarika’s. Built by a visionary, Dwarika Das Shrestha after he had spent years collecting traditional Nepalese woodwork, windows and antiques it is still managed by his family. It is a magnificent collection of unique suites, and I hope we return to stay there one day! Visit http://www.dwarikas.com. 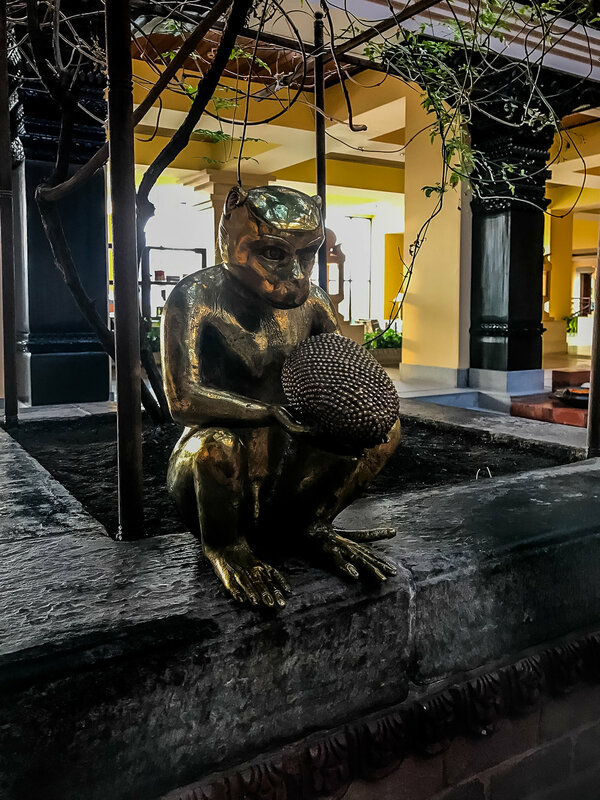 Eventually, it was late enough that we were all tired, so after seeing the kids to their home, and a vigorous game of ping-pong between Nabin and Julian, we were delivered back to the beautiful Hyatt, and slept the sleep of the tired and peaceful. Thank you to the Pinde family for making our very quick stop in Kathmandu unforgettable! Come to Florida to visit soon! And by the way, who in their right mind would plan to spend one night in Kathmandu? Next time we’ll do it differently.